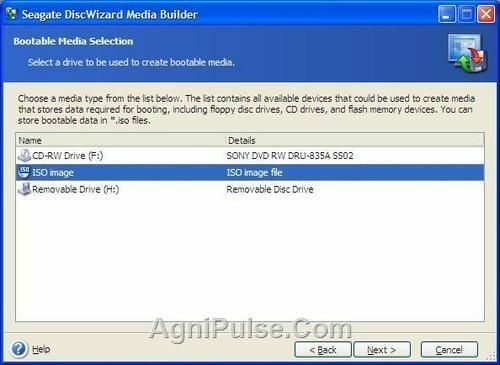 Bootable Media builder of Acronis True Image creates a standalone version of Acronis True Image which can be booted from your CD-ROM or your USB Drive or other secondary media.This standalone version can be used to restore and recover a crashed computer that cannot boot. For those of who don’t know you can get Acronis True Image Completely free if you have a Seagate or a Western Digital Hard Disk. Searching on google I found these two guides to boot Acronis True Image from USB Flash Drive and USB Hard Disk. The problem with the above guides is that it uses the bootable media builder itself to create a bootable USB .The bootable media builder creates some .DAT files on the root of your USB and installs a bootcode to the MBR of your USB Disk. I had Kaspersky Rescue Disk 10 on my USB which I had created using the KRD 10 Bootable USB Creator .Now when I used Bootable Media Builder on my USB drive, I could only boot to Acronis True Image.I could not boot into KRD10.The ideal solution for this is to multi boot both KRD 10 and Acronis True Image using a single boot code – Grub4Dos. Grub4Dos has a special feature called iso emulation.We will be using this feature to boot the Acronis True Image ISO from USB Flash Drive or Hard Disk. Install Grub4DOS to your USB Flash Drive using RMPrepUSB.Click on Install Grub4Dos button in the main interface of RMPrepUSB.If you want to boot Acronis True Image from your Hard Disk then read Install Grub4dos to your Hard Disk. I feel that using the ISO emulation feature to boot Acronis True Image is more elegant and useful for booting from USB Flash Drives and Hard Disks.The root of your USB drive is less cluttered and you can multi boot other software easily. Bharat Balegere is a 27 year old blogger from Bengaluru. He is a technology enthusiast and loves tinkering with computers and usb drives. Excellent i can did that, formatting the usb as XP, fat 32, lba, boot as hdd with RMPrepUSB. generate de menu.lst trough windows notepad. copy the code. Hirens 2018 New Generation Support GPT! Easily Modify Boot Sectors with Bootice!